The Zenato winery possesses a strong link to the richness of its local history and culture, and continues to develop this connection today. The estate is based in a territory that surrounds Lake Garda, with an extraordinary microclimate that allows for an optimal growing season. Cherishing a 'frank and simple' approach to life, Zenato is committed to producing affordable wine of exceptional quality. With a passion for the land and a dedication to vigorous research, innovation and quality improvement, Sergio Zenato strived to eclipse past results. He crafted wines that are known for their quality and consistency. Founded in 1960 by Sergio and Carla Zenato, the Zenato winery was originally based on the production of quality wines from an indigenous varietal, Trebbiano di Lugana. 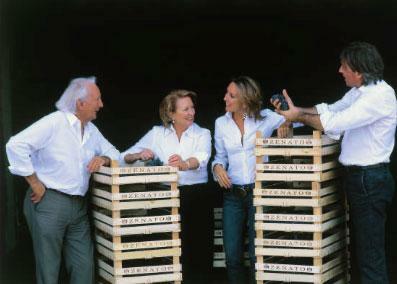 Over time, the winery has been passed to Sergio and Carla's children, who have maintained and expanded upon this vision. Their daughter Nadia currently handles the marketing and promotional activity for the company, while their son Alberto oversees all aspects of production, from the growing of the vines to the completion of the bottling process. Zenato has also explored another important area of Italian wine production -- Valpolicella. It is here that they have dedicated endless efforts to the improvement and success of Amarone production, a wine of noble attributes and prestige. Zenato has entered into international markets and received the highest accolades from the wine industry's leading experts, praise that reflects the way in which the company operates on a daily basis. Today, Zenato continues to look to the future and invest in development projects based in the areas of Valpolicella and Lugana. Wine Enthusiast 89Bright and refreshing, this opens with delicate scents of field flower, yellow stone fruit and a whiff of crushed mint. The tangy palate delivers tangerine, lemon and yellow peach alongside a hint of white almond. The Zenato Pinot Grigio has become a staple as an entry-level, everyday Pinto Grigio. Made from 100% Pinot Grigio grapes that are crushed and fermented in temperature-controlled stainless steel tanks. The wine is delicate with scents of classic citrus and floral notes in a balanced elegant style. An elegant Valpolicella, with fine tannins and fresh acidity layered with flavors of ripe black cherry, incense and orange zest. A rich hint of loamy earth lingers on the lasting finish. Vinous Media 92"Deep ruby-red. Strong note of herbs, quinine and roasted red fruit on the nose. Then fresher and cleaner with lovely floral flavors of red cherry and spicy herbs. Finishes long with youthfully chewy tannins." Wine Spectator 88A subtle red, well-knit and fresh, with fine-grained tannins and hints of plump cherry, dried thyme, graphite and spice. Drink now through 2018. Wine Spectator 91"This creamy Amarone shows lovely balance, with delicate spice and orange zest accents enlivening the flavors of black cherry puree, dried lavender, date and mineral. Well-knit tannins provide a supple frame." Wine Enthusiast 89"Aromas of banana, apricot, honeysuckle and tropical fruit lead the nose. The round, medium-bodied palate offers creamy white peach, green apple, tangerine and a hint of honeydew melon. Fresh acidity brightens the rich flavors." Wine Spectator 93A pure note of lingonberry preserves heralds this finely knit, mouthwatering red. The ripe fruit is meshed with supple tannins and flavors of dried marjoram, dark chocolate shavings, rich, woodsy minerality and creamy melted licorice. Offers a lasting, harmonious finish.